The seabream is flavored with the konbu using a specific Japanese technique known as “kobujime”, resulting in the taste and umami of the bream gradually spreading across the tongue. 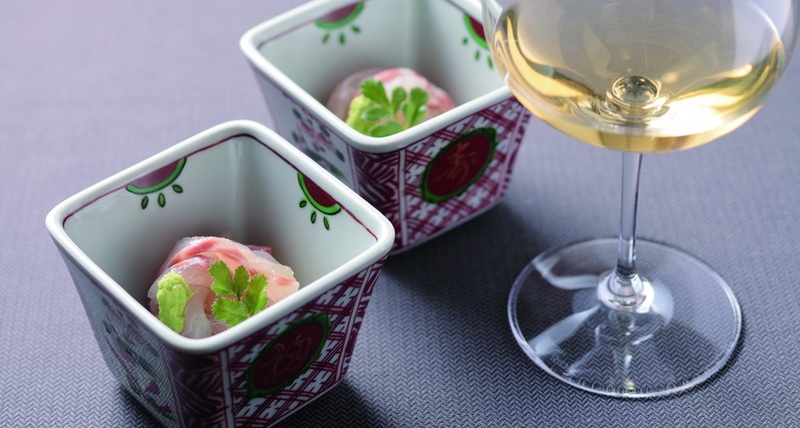 A powerfully mineral wine makes a perfect balance with raw seafood, and Chablis in particular. The umami of the bream gradually intensifies and the addition of citrus underscores the harmony between the wine and the dish. 1. Remove the filets from the seabream. Take off the skin and cut with the grain into 7-8mm slices. Salt and set aside for around 30 minutes. 2. Pour a little light soy sauce into the sake and then pour this onto the fish. 3. Rub the surface of the konbu with a damp cloth to moisten. Lay some food wrap in a dish. Place the konbu on top and then the fish. Wrap the fish in the seaweed and seal in the food wrap. Place a weight on top and allow the konbu to infuse the fish for between two and five hours. 4. Pour the light and concentrated soy into the dashi broth. Add the grated citron peel and the citrus juice. Put through a fine sieve. 5. Remove the slices of fish from the konbu and arrange on a dish. Garnish with the wasabi, fang feng and Japanese knot weed. Pour the broth into the dish around the fish. *Dashi is an infusion of konbu and dried skipjack tuna, used in many Japanese dishes. Right now, I can only find chablis-wines.com on text search after digging a few pages (that's NOT good), competitors above are getting all the traffic and business! Love the weed content on your site! You know, most websites get traffic from their blogs, and we feel that you could use a little help, since you are not blogging weekly yet. You are receiving this email because the contact form at chablis-wines.com is open to the public. Love the weed content on your site! You know, most businesses get traffic from their blog, and we feel that you could use a little boost, since you are not blogging daily yet. You can have your new article to post on chablis-wines.com starting at $10 in as little as 5 business days!